If you have been making soaps for a long time, making cold process soaps is a natural next step. Today’s recipe will be for the Green Tea Supreme; our second ‘tea’ inspired soap. 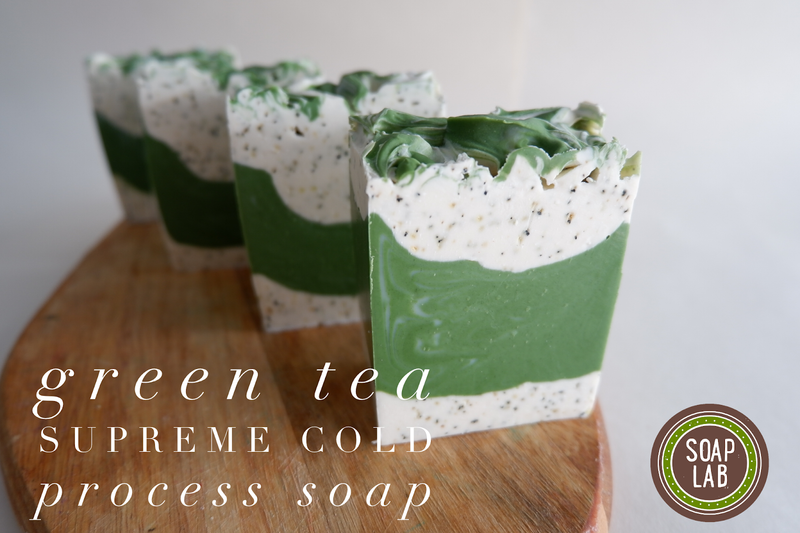 Cold process soaps are incredibly moisturizing and healthy for the skin. We added almond oil and distilled water to an oil mix consisting of castor, palm, olive and coconut oil. The oil mix has many benefits. For instance it keeps your skin moisturized and hydrated. This in turn makes your skin soft and smooth with a radiant glow. Almond oil is rich with Vitamin A which is great as anti aging. It also helps retain moisture in the skin which reduces dried and chapped skin. For a pleasant and relaxing aroma, we added Baby Clean and Goodnight Baby fragrance oils. For coloring, we used, chromium green and titanium dioxide mica. Add in room temperature Lye Water. Add in Baby Clean Fragrance Oil into the mixing container. Next, add in Goodnight Baby Fragrance Oil. Mix to combine the 2 oils into the mixture. Next, add in some tea leaves. Using a spatula, mix to combine. In the other container, add in Chromium Green Mica that also has been diluted with Almond Oil. Mix with a whisk. Next, add in the green soap mixture. Gently tap again. With the remaining white soap mixture, fill the mold to the brim. Dollop on some remaining green soap mixture on top. Using the end of a spoon, swirl both colours together to create soft peaks. Leave soap to harden for 24 hours.